This time the Epistle is 2 Corinthians 3:4-11 and the Gospel is Mark 7:31-37, the healing of a deaf-mute, which involved Jesus spitting, sticking his fingers in the man's ears and touching his tongue with a finger (possibly moistened with spittle) before groaning the Aramic word "Ephphatha," meaning "Be opened!" My original tune for this hymn is titled EPHPHATHA, but really there are loads of existing tunes that would suit. His voice revives the dead. The words and signs agree. Yet deigns to use mere spit! What chains will not be sprung? Served by His Spirit’s pow’r. Till we with Him are filled! What Christ to us extends. Both hear and speak His grace. With this, at least the 150th original hymn I have written, I return to my "Sundays of the Church Year" hymn project. 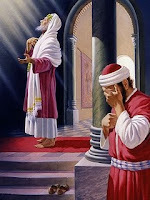 It is based on the story of the Pharisee and the publican (i.e., tax collector) told by Jesus in Luke 18:9-14, the Gospel for Trinity 11. In the last stanza there is just a touch of the Epistle from 1 Corinthians 15:1-10. The tune is SPIRIT OF CHRIST, which I wrote earlier this year for a hymn by my friend Matthew. Actually I ruthlessly bullied him into revising and condensing his original poem, which wouldn't have fit this tune, and in the end I think he liked his original version better; so perhaps this is not so much a case of reusing an existing tune as rescuing one all Tinkerbell like from the edge of oblivion. He had his full reward. Owned sinner as his name! Who to the temple came. Told to secure your loss! Points to your Lord who died! Early this morning I had a dream that broke all the rules of the "showed up in school in your tighty-whities" genre. Rule 1: Without any explanation, you suddenly find yourself at school in the middle of the day wearing nothing but undies. Me? I showed up early for school in my undies, reckoning it was due to some kind of hazing ritual or a handicap in a game. I was just glad to get ahead of the morning rush. Rule 2: Your response to the looks everyone gives you is to wish you could die of embarrassment. Me? I gave anyone who looked in my direction the "Got a problem with that?" stare. Rule 3: You remain paralyzed with horror until the dream ends or you wake up. Me? 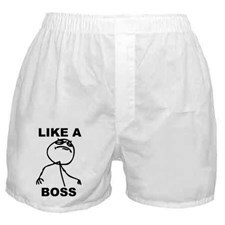 I went to my locker, rummaged around in it and brought forth a T-shirt and a pair of sweat pants I had discarded there on some previous occasion. Not a perfect solution, still a horrible outfit, but at least it was one I could lie low in. Then the dream moved on to another challenge. It would be nice to feel so in-control of the everyday crises in my waking life. Botswana's first private detective works a case she doesn't even get to finish in this fifth novel of the No. 1 Ladies' Detective Agency. It isn't terribly mysterious. Her client, a successful businesswoman, has decided to settle down and get married, so she asks Mma Precious Ramotswe for advice on which of her four suitors is the most suitable. Could it be the earnest, if dull, schoolmaster who takes a single-minded interest in reforming bad girls? The popular radio host? Or if neither, one of the others? The investigation takes a back seat to other matters around the shared offices of the agency and Tlokweng Road Speedy Motors. As has happened before in this series, things develop so quickly that time seems to run out on the case before the investigation really gets anywhere. But after all, the cases in this series are more studies of human character than actual mysteries. Among the characters it studies are the matron of the Tlokweng Orphan Farm, who hectors the kindly mechanic Mr. J.L.B. Matekoni into agreeing to jump out of an airplane for charity. Then there's Mr. J.L.B. Matekoni, who faces not only this terrible ordeal but also a confrontation with a tough but dishonest colleague in the auto repair trade. The absurd young apprentice named Charlie gets a starring role, and of course Mma Ramotswe stands at the center of it all, trying to bring her engagement to Mr. J.L.B. Matekoni to its long delayed culmination. What this book, and each book in this series, lacks in breadth of structure or in the force of a mystery-thriller plot line, it makes up in warmth, truth to it characters, gentle humor and a touch of lyricism. All these merits shine out even more in the audio-book version ready by Lisette Lecat. The next of so far 16 books in this series is In the Company of Cheerful Ladies. The Feast of the Visitation is July 2 in the historic Lutheran lectionary. The Epistle, for want of a better term, is Isaiah 11:1-5. The Gospel, really the text of this hymn, is Luke 1:39-56, in which the Virgin Mary (while pregnant with Jesus) visit her kinswoman Elizabeth (who is pregnant with John the Baptist). It's a text I have used before as the basis of a hymn, but to a different purpose. The tune is HOLY DAY, which I previously wrote for my "Third Commandment Hymn" - though the musical joke I worked into it doesn't have any relevance to this text. As she neared her cousin’s home! To enclose our Lord and God? Bear the flesh of Him we laud! Him who spans the heavens broad? Mary knew it would be so. Of the unborn prophet’s leap. In our time to such as us! By the Spirit even thus! To His name in praise profuse! Here I go again, way out of season, just filling another gap in my hymn tour of the church year! Ash Wednesday, forty days before Easter (not counting Sundays, because they're all Easter), is the beginning of the Lenten season, which focuses on repentance and a spirit-over-flesh sort of discipline. The Epistle, which in this case would better be called the First Lesson, is Joel 2:12-19. It's actually not the only time this Old Testament prophet's slender, three-chapter book pulls Epistle duty in the historic lectionary; the other is Pentecost, with a selection from the end of the same chapter. The Gospel (for Ash Wednesday, mind you) is Matthew 6:16-21. The tune is UNCTION, which I wrote in 2003 for a hymn by N.F.S. Grundtvig. Rend your heart and not your clothes! From His just and wrathful oaths! Turning curse to precious gift. He our bill of shame might lift! To blaspheme our Lord who died! None can pilfer or destroy! Christ your fullness, Christ your joy! Lest by pride you sin again! Made you righteous there and then! For the love His cross displays! I wrote this hymn to fill a use in my planned collection of "useful hymns." It goes to the tune GENESIS, which I wrote a little while back for a hymn on creation. Go in grace, dear sisters, brothers! Go in peace, your souls restored! Go in love toward one another! Go in faith toward Christ our Lord! May God bless your meditation! May He answer all your prayers! May He strengthen your vocation! May He lessen all your cares! But the mind of Jesus seek! As God’s temple, set apart! That their faith may thrive and grow! And God’s kingdom is the prize. Come, receive the gospel seed! Growing up in Christ our Head! To be filled again with joy! Our regret at each goodbye! 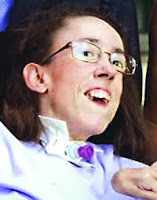 This hymn is in memory of my dear sister in Christ, Alexis Wernsing, who died recently after a 40-year lifetime in which she bore physical disability with amazing cheerfulness and strong faith. I've had the sniffles the last few days, but at times when I catch myself complaining about it I am struck by the thought of the constant pain and weakness Alexis lived with every day of her life, when doing things I can do without a thought required total effort on her part. Her death is a sharp loss to the small congregation I belong to, but her freedom from the disability she experienced in this life, together with her inheritance in heaven, is a great gain to her. For the tune, I am going with DEDICATION, which I wrote in 1993 for another hymn. For all flesh the Stricken One. Look down, O Lord, upon our blindness! With the gospel’s healing light! All as it was meant to be! Give ear, O Lord, unto our crying! Loose our tongues for faithful speech! And reply with ready shout! We may stand before Your face! Double tolls and trouble dire! When You passed this way before! Both our soul and feeble flesh! In Your splendid image dressed! The Epistle for this service is 1 Corinthians 12:1-11, a passage concerning spiritual gifts. The Gospel is Luke 19:41-48, Jesus weeping over Jerusalem and driving the merchants out of the temple. The tune I selected is FINNISH SONG from Suomen Koraalikirja, 1738, which interests me as a sort of major-key twin to the chorale DER AM KREUZ. Till the Spirit they received. Can we honor Christ indeed. Is our first and greatest need. Had He not confessed them first. Once on Him our hopes are nursed. Though He also is God's Son. To the body, on their own? Better were they set aside! That His church be edified! Fellow saints, be not puffed up! Pouring pain into their cup. On one living Bread we sup. Laud each Person in His place! We cross over into bliss! The Epistle for this service is 1 Corinthians 10:6-13, the passage directly following the Epistle for Septuagesima. The Gospel is Luke 16:1-9, widely known as the Parable of the Unrighteous Steward. The tune is ST. ALBINUS by Henry J. Gauntlett, 1852. Or despise their sacred mission? For this promise, never broken! Again I'm skipping over a Sunday, since I wrote a hymn in 2007 that answers for the 7th Sunday after Trinity. As for the 8th ditto, the Epistle is Romans 8:12-17, the paragraph immediately preceding that of the 4th ditto. The Gospel is Matthew 7:15-23, near the end of Jesus' Sermon on the Mount. I know of two tunes that could be used for this hymn: HEILGER GEIST, DU TRÖSTER MEIN, a 15th century German melody published in Bremen in 1633, and here placed above the following hymn; and ST. PHILIP by William H. Monk, 1823-89, below it. Lest false guides your way pervert! For the foe designs your hurt. Tear the flock; their teaching damns. Only to sound words subscribe! Changing us from sons of hell. Peace to soothe our daily cares. He will keep your footsteps straight. Till you taste of Paradise. Lest to wolves your flock succumb! Bear us, Savior, safely home! In the fourth novel of the No. 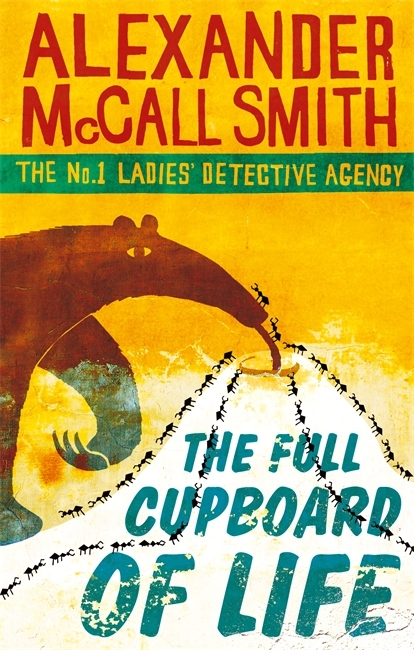 1 Ladies' Detective Agency, Mma Precious Ramotswe of Gaborone, Botswana works two paying detective cases. One is to help a successful man find and make amends to the people he wronged when he was a young scholarship student. The other is to satisfy the jealousy of a woman whose husband is cheating on her. But just as challenging, if not more so, are her personal conundrums, such as how to cope with an increasingly troubled foster son, helping her trusty assistant Mma Makutsi find romantic happiness, and staying in business while a new competitor, the Satisfaction Guaranteed Detective Agency, is spreading the word that women are not cut out for the trade. This is the installment when one of Mr. J.L.B. Matekoni's apprentice mechanics at Tlokweng Road Speedy Motors gets religion in a Pentecostal church; when Mma Makutsi starts her own side business, only to have her head turned by a man who is not what he seems; and when the author himself seems to smile at his own main character out of a photo album shared by a real, live person who plays a minor recurring role in the series. Here the Scotland-based author gives us a clue as to where he mined these stories of Botswana manners, morals and minor mysteries. Told with clarity and gentle humor, this story like others in its series presents a charming picture of an under-appreciated African country in recent times, peoples it with endearingly flawed characters, and challenges them with ethical dilemmas and emotionally explosive situations. That they come through all these with grace tells us something interesting, I think, about the character of their creator. The audio-book read by Lisette Lecat was, as usual, a delight to the ears. As I write this I am already well into the next book in the sequence, The Full Cupboard of Life, which is followed by ten more. Its author has also published a three-book children's series featuring Harriet Bean, a five book ditto featuring an African boy named Akimbo, two Max and Maddy mysteries for young readers, ten or eleven Isabel Dalhousie mysteries, ten 44 Scotland Street novels, three Corduroy Mansions books, and four or five children's books featuring Precious Ramotswe, besides numerous other novels and several non-fiction titles including Who Invented Peanut Butter? and What W. H. Auden Can Do for You. The Epistle for this service is Romans 6:3-11, in which Paul delves into the importance of baptism in the Christian's daily life. The Gospel is Matthew 5:20-26, roughly a paragraph from Jesus' Sermon on the Mount. The tune that stirred my creative juices was MEINE HOFFNUNG by Joachim Neander, 1680. Of the scribes and Pharisees? Who can merit heaven's treasure? Who is there more pure than these? All God's justice to appease. By each faithless thought condemned. Flame and torment without end. Hell itself and rose again. Out of sin and death's domain. As His death paid all our price. Sell ourselves again to vice? Slaves of death no more to be. Bound to serve Him joyfully. Ere we treat with God above. And ourselves are signs thereof. The Epistle for this service is 1 Peter 3:8-15, ending with the words "but sanctify Christ as Lord in your hearts." The Gospel is Luke 5:1-11, the great catch of fish. 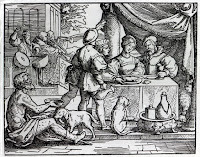 The tune is WOHLAUF, DIE IHR HUNGRIG SEID, from a Bohemian Brethren hymnal of 1561. Whereby Your aims to promote? You said, "Launch out to the deep!" Simon, perplexed, yet did as You bade. When faith requires us to leap? You told them, "Let down your net!" Can we this wonder forget? "Go, Lord! Nor touch a sinner like me!" To trust Your powerful word! All those engraved on Your hand. Set on our spirits Your seal! I'm skipping Trinity 3 because I've already written a hymn on it. So on we go to Trinity 4, for which the Epistle is Romans 8:18-23, and the Gospel is Luke 6:36-42. The tune is HVOR SALIG ER DEN LILLE FLOK by Ludvig M. Lindeman, 1812-87.
Who will not pardon them! They lose the choicest gem! Who sees into the heart! As stewards of His word. Rejoice when sinners mercy find! Your rock and sheltering wall! In the third book about the No. 1 Ladies' Detective Agency of Gaborone, Botswana, Africa, Mma Precious Ramotswe's highly capable secretary gets her second promotion. First Mma Makutsi rose to Assistant Detective. And now that the agency's offices are to be consolidated with those of Tlokweng Road Speedy Motors, while its proprietor and Mma Ramotswe's fiance Mr. J.L.B. Matekoni is temporarily indisposed, she has also become Acting Manager of the garage. Mma Makutsi quickly brings order to a business struggling under the idleness of its two frivolous young apprentices. The agency, meanwhile, carries on with its succession of low-key cases. Mma Ramotswe does an African impression of Miss Marple, staying at the family farm of a government man who thinks his sister-in-law is plotting to poison his brother. Mma Makutsi helps a fashion maven choose the most deserving winner of the Miss Beauty and Integrity contest. And while Mma Potokwane, matron of the Botswana Orphan Farm, looks after Mr. J.L.B. Matekoni during his course of antidepressants (don't ask), the possibility niggles at all of them that one of her young charges may have been a wild boy raised by lions. As this series unfolds, it becomes increasingly apparent that it is not a set of murder mysteries or crime novels. The title of this book holds a hint as to what kind of stories are in it. Besides exploring the values of Africa at a tipping point between the traditional and all that is modern, it also provides deep reading of the character's hearts and a loving, lyrical depiction of the country next door to where its Scotland-based author was brought up. The scene when Mma Ramotse wakes up early at her client's family farm, basking in the distilled beauty of the land just before the sun rises and coarsens everything, is one of several passages of understated beauty conveyed with an exquisite economy of language. This is just one of many possible examples I have spotted, so far in this series, of what another reviewer (quoted on the cover of the next book in the series) described as "art concealing art." It is, I imagine, the perfect emblem of a dry and sparsely populated country whose natural beauty must, at its best, seem understated. Like the books before it, I enjoyed hearing this one read on audio CD by Lisette Lecat, an international actress of African birth whose voice has a vast range not only of pitch and dialect but also of character and expression. I have heard few female audio-book readers who can deliver male dialogue as convincingly as she can, and even fewer male readers who can cross that line as well from the other direction. But I am especially in love with the voice she reserves for Mma Ramotswe, the kind of voice that makes me think a "traditionally-built" Botswanan woman might just be my type. 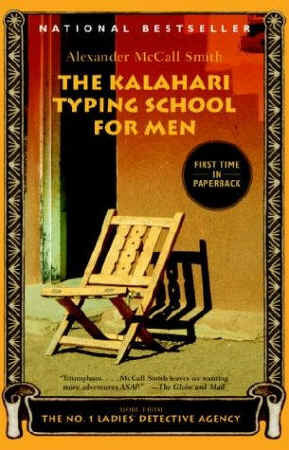 After coming to the end of this book, I wasted no time before visiting the local library and checking out the fourth book in the series, The Kalahari Typing School for Men. This is based on the Epistle, 1 John 3:13-24, and the Gospel, Luke 14:16-24. A hideous catastrophe befell me while I was writing this. I had written five stanzas to my own satisfaction, but when I went to save the document Word glitched out, said either the file was corrupt or there was a permission error, and deleted it - a document I had been working on since the first of the year. I was able to recover the document from a backup copy, and about two and three-quarters of the stanzas I had written were fortunately stored on the clipboard, and by memory I was able to recover the rest of stanzas 3 and 4; but rewriting stanza 5 turned out to be far harder than writing it in the first place. Here is the outcome, for what it's worth; the tune is LIEBSTER IMMANUEL, from a Leipzig hymnal of 1675. Shall we such honor and pleasure despise? Unjust to others, unclean in Your eyes. Keep us from tasting Your heavenly feast? We tempt Your word to withdraw from this place! We close the door on our moment of grace! Crippled and blind, the cast down and cast out! Love of each other, unfettered by doubt! May know the truth and in true love abide! Joyfully trusting in Christ crucified! Now that I've filled in all the Sundays of the "festival half" of the church year in my "hymns for every Sunday of the church year" project, it's time to move on to Ordinary Time. Depending on the date of Easter, there may be between 22 and 27 Sundays after Trinity in any church year, Trinity Sunday being one week after Pentecost. The nomenclature of Sundays after Trinity is historically Lutheran, while Catholics and Protestants follow other naming systems based on Sundays after Pentecost or Sundays of Ordinary Time in which, confusingly, the weeks have different numbers. Then there is the most recent wave of liturgical reforms, which dispense with propers filed under Such-and-such Sunday after Whatnot in favor of a numbered list of propers, each to be observed when Sunday falls within a given range of dates. I think it's a bad idea for Lutherans to go along with this because, among other reasons, it distances us from the counsel of Dr. Martin Luther, whose books of House and Church Postils provide excellent examples of how to preach on the lessons for each Sunday after Trinity and the rest of the church year. I consulted his Church Postil sermon for the First Sunday after Trinity before writing this hymn, and I believe I profited by it. The Epistle for this mass is 1 John 4:16-21 beginning with the words "God is love." The Gospel is Luke 16:19-31, Jesus' account (not exactly a parable) of the rich man and Lazarus. 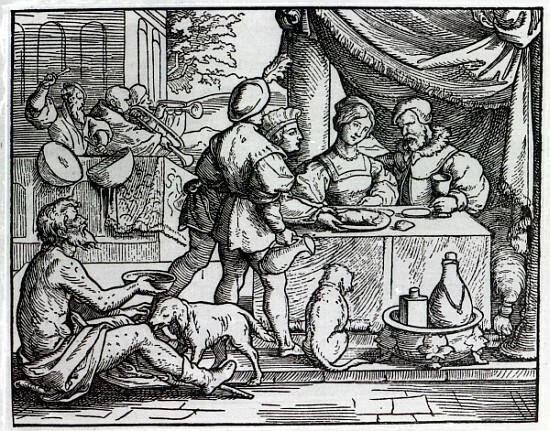 The tune is HEUT SINGT DIE LIEBE CHRISTENHEIT, Nürnberg, c. 1555. Lest we take curse for blessing! But Hades claimed the other. Grim warning to his brothers. Let Moses and the seers be heard! If one should came back from the dead! His word were no more heeded. Help us by faith receive you! And heal the faults that grieve you! With faithful hope sustain us! The cross we need to train us! And likewise live within us! And rose again to win us! The historic Lutheran mass for the third-last Sunday before Ash Wednesday centers on the Epistle from 1 Corinthians 9:24 to 10:5 and the Gospel from the parable of the laborers in the vineyard, Matthew 20:1-16. Here is my attempt to combine the two lessons into a single argument, set to a 19th century adaptation of the 10th century plainchant tune REX CHRISTE, FACTOR OMNIUM. From Moses’ exodus till now. They ate the living, heav’nly Bread. Be careful, brethren, what you think! Was also Christ, the Lamb of God. For all men’s good He dared to die. The wages due God’s holy Son. Fixed on this everlasting prize! At last be lost, disqualified! Yet know Christ’s promises are true! You too will see His beaming face. I am daunted by the task to compose an original hymn for the Transfiguration of Our Lord, when there are already several excellent ones, each approaching the story from a different but spiritually useful angle. The story of Jesus' transfiguration is recorded in Matthew 17:1-9, Mark 9:2-8, Luke 9:28-36 and briefly with interpretive comments in 2 Peter 1:16-21, which happens to be the Epistle for the mass of the Transfiguration. The Gospel thereof is Matthew's account. The tune is the chorale MEIN SCHÖPFER, STEH MIR BEI by Franz H. Meyer, 1740. On Peter, James and John! Of garments white as light! On You, O Christ, alone! Until Your course was run. So wretched, low and weak! Such glimpses all too fair! Your stricken flesh and blood! And hope beyond death's curtain. Till we Your glory share! 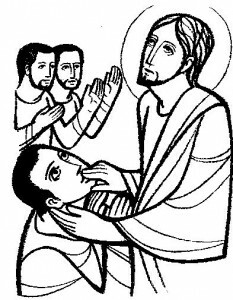 The Feast of the Transfiguration of Our Lord is a funny thing. In most of Christendom, outside Lutheranism and a few other Protestant bodies, it is celebrated on Aug. 6 or, in communities too conservative for the Gregorian calendar, Aug. 19. In some Scandinavian Lutheran bodies it is observed on the 7th Sunday after Trinity, a.k.a. 8th Sunday after Pentecost. Most Lutherans observe Transfiguration on the last Sunday after Epiphany, but among them those who follow the revised lectionary of the period influenced by Vatican Council II consider that to be the Sunday immediately before Ash Wednesday, formerly known as Quinquagesima. But in the increasingly narrow sliver of liturgical tradition in which I feel most at home, the Pre-Lenten "Gesima" Sundays still stand as a buffer between the Epiphany season and Lent; so Transfiguration is three weeks earlier on the Sunday before Septuagesima - except when there is only one Sunday after Epiphany, which can happen when Easter falls between March 22 and 24. So this hymn, understand, is intended for that interpretation of Transfiguration Sunday within a projected series of hymns for every Sunday of the church year. Perhaps ironically, it's the only scenario that includes the (slight) possibility of a year without Transfiguration.